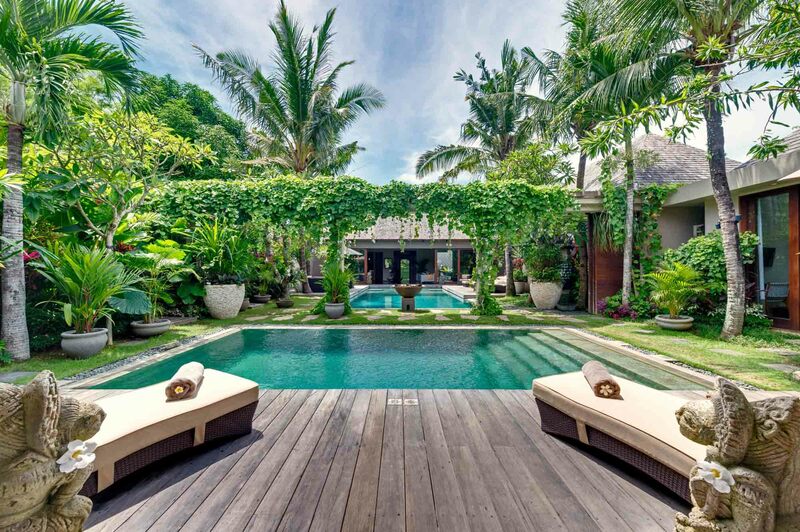 Set in the exclusive Laksmana Estate just steps from the beach and the Indian Ocean, Villa Adasa is a chic 3-bedroom luxury villa that can easily sleep up to 6 adults, making it a stylish escape for families with children, groups of friends or couples looking for space and seclusion in the heart of Seminyak. 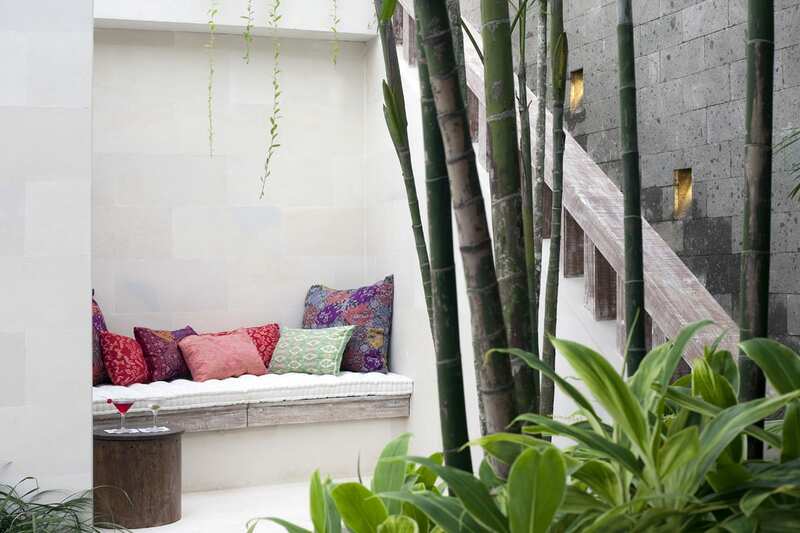 We love the attention to detail here from the antique stone water features to the vibrant batik cushions, gleaming teakwood floors and comfy goosedown duvets. 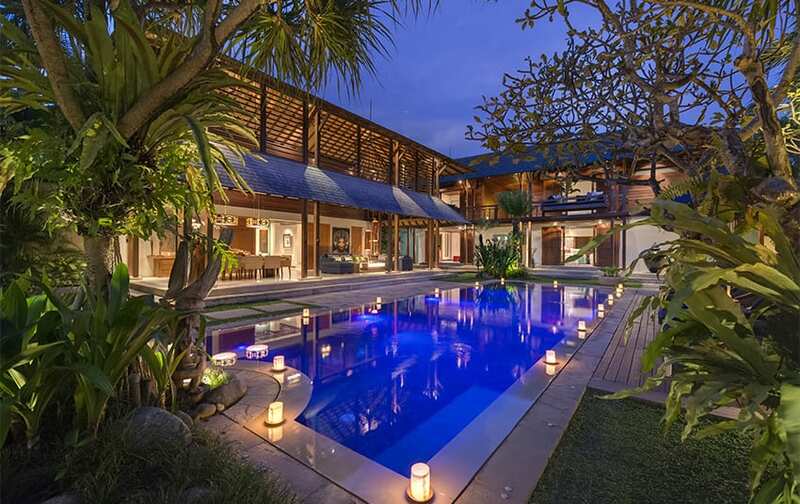 If you’re looking for a stylish home base in south Bali, Villa Adasa is an ideal choice. 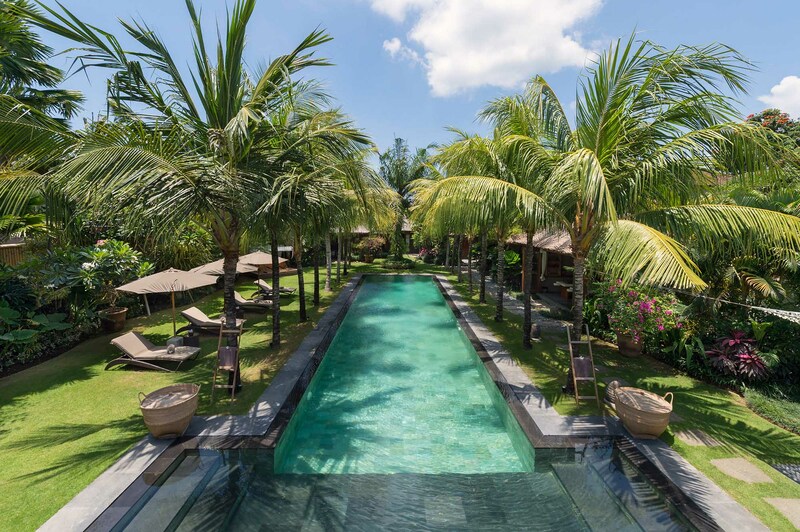 As you pass through Villa Adasa’s elegant entrance door with its bronze mudra hands, you enter lush gardens adorned with three interconnected buildings spread out in a U around the green stone tiled pool. 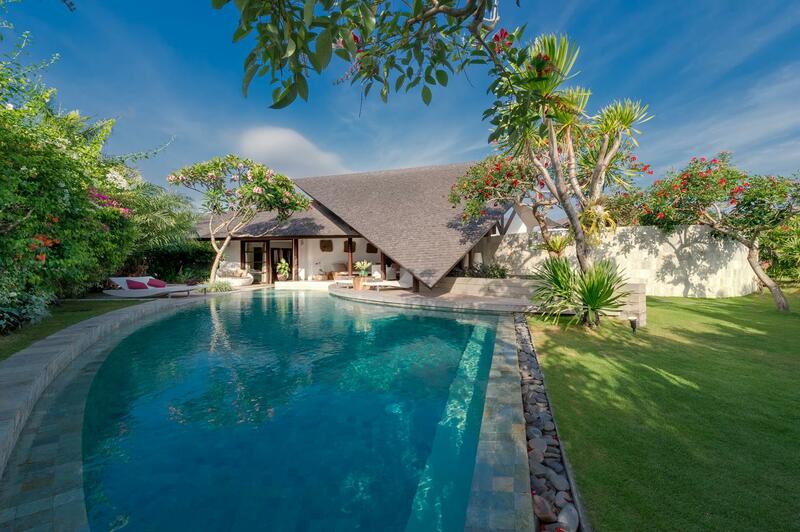 Traditional Balinese features abound like alang-alang thatch, ironwood shingles and Palimanan stone columns, and the eye-catching decor includes black and white prints from the 1930s, Turkish and Tibetan rugs and oversized daybeds with plush pillows. 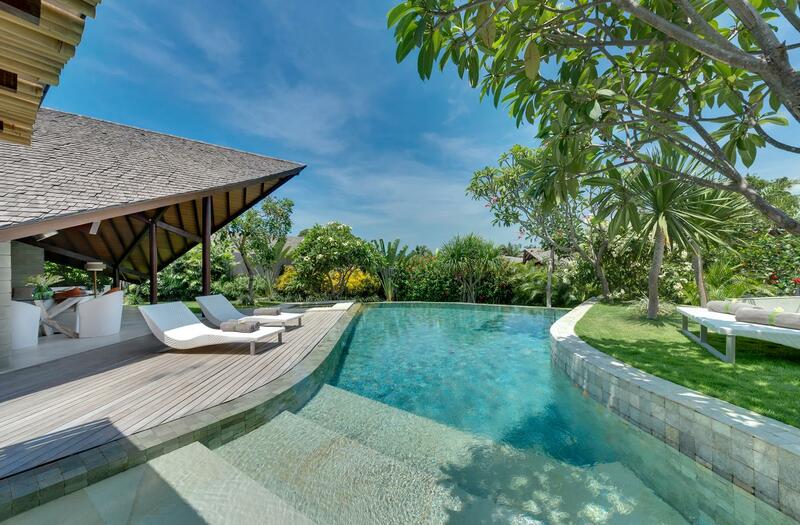 Guests can while away the hours napping in the relaxation bale next to the pool, meditating on the private roof deck, watching movies on the HD TVs in the open-sided living pavilion or in each of the bedrooms, and dining on delicious seafood barbecues prepared by the talented villa chef. 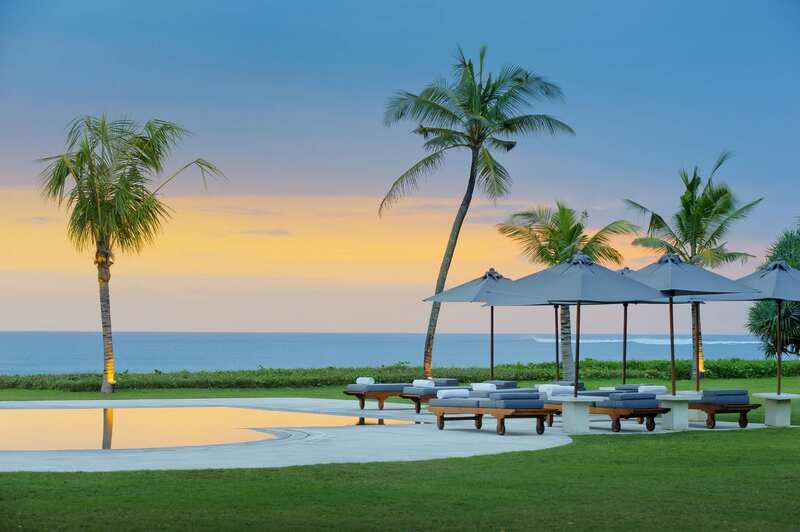 Sunset drinks are a must at the recycled teak bar overlooking the pool, and a dip in the cool water under the stars makes for the perfect end to another sublime Bali day. 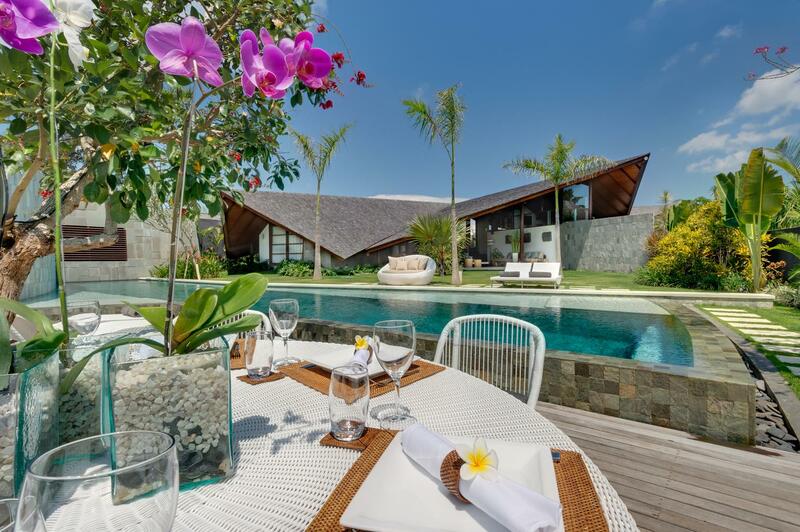 The main living and dining pavilion at Villa Adasa is lined with fishponds and bubbling water fountains, and it features soaring ceilings, terrazzo floors, comfy cream sofas and a long teak dining table that can seat 8 people in cushioned wicker chairs. 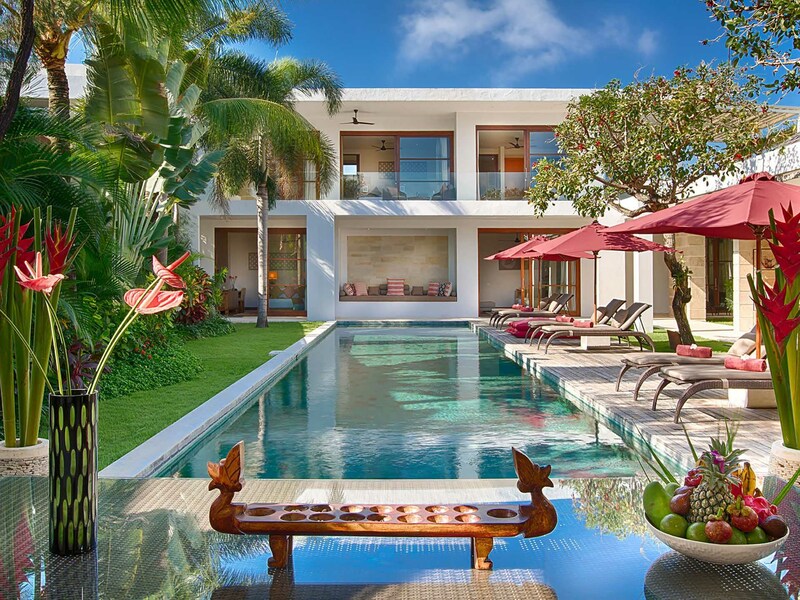 The space is open sided to allow breezes and light to flow in, and it offers views out to the pool and gardens. There is also an HD TV and DVD player and a Sonos stereo system that you can control with your smartphone or laptop. 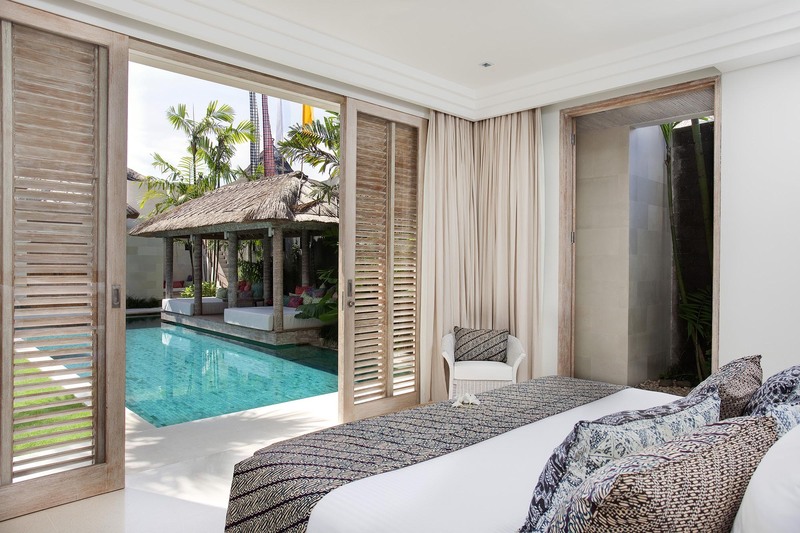 The master bedroom occupies the entire top floor and it boasts a king sized bed with a goosedown duvet, a study and reading area, HD TV and DVD player, and an ensuite bathroom with a bathtub, walk-in shower and a window looking out to Bali’s most sacred volcano, Mount Agung. 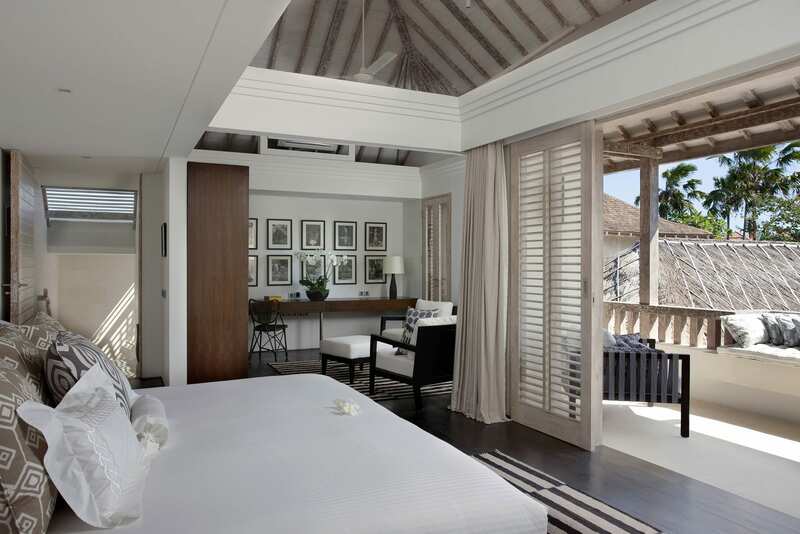 In the bedroom wing, two guest bedrooms are on the ground floor, each with sliding glass doors that open directly to the pool and gardens, king beds that can convert to twin beds, HD TVs and DVD players, and ensuite bathrooms with gorgeous walled gardens. 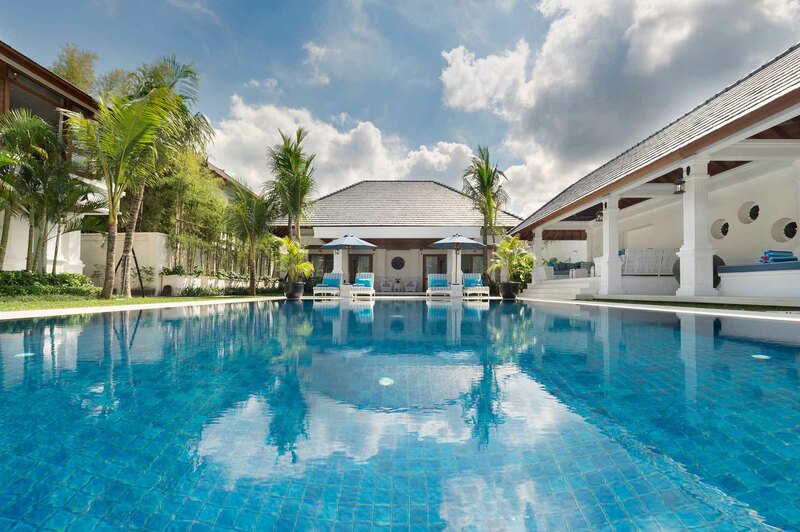 Beyond the pool, there is a flat-roofed building that houses the modern kitchen and staff quarters, as well as white washed shutters that open to reveal the bar. 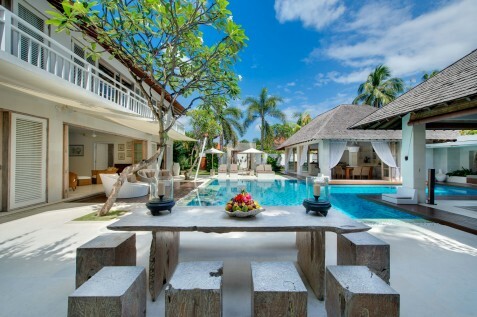 This is where you can grab snacks, light lunches and cocktails prepared by your villa chef and served by your personal villa butlers. 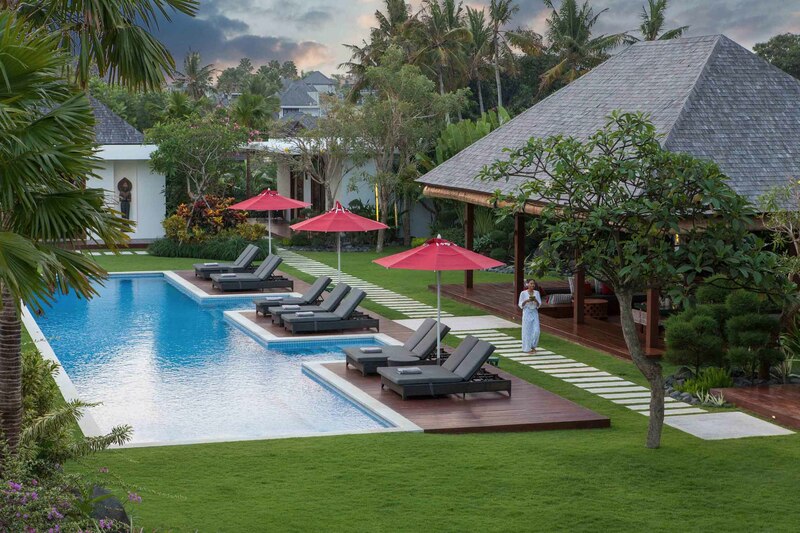 Finally, the pool is where you will probably spend most of your time, as the water is cool, clear and inviting, the covered relaxation bale beckons with its king-sized daybeds and multitudes of soft batik covered cushions, and comfortable sun loungers rest on the grass with tasteful white umbrellas for a bit of shade. CAPACITY 6 people (3 ensuite bedrooms: 1 with king-size bed, 2 with twins converting to king), 4 extra beds on request (extra costs apply). 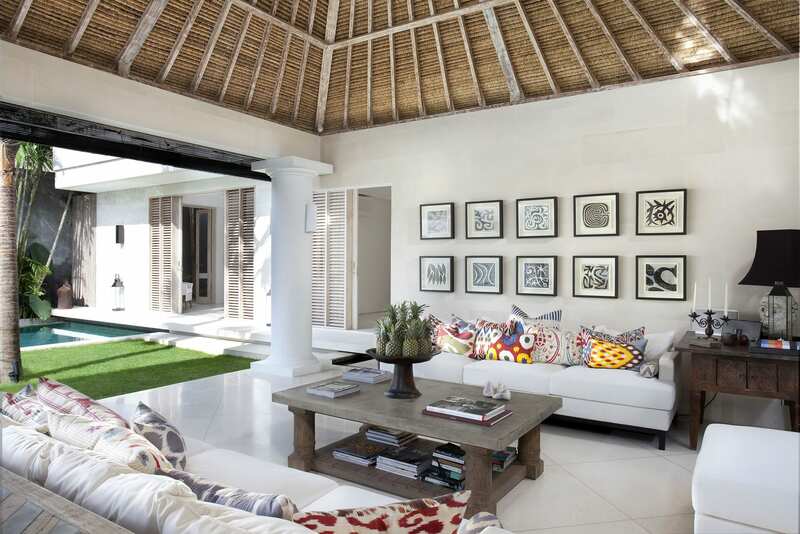 LIVING AREAS Huge open-sided living and dining pavilion with seating for 8, upstairs air-conditioned TV room/office within master bedroom suite, poolside bale, sun terrace. POOL 7 x 4 metres. 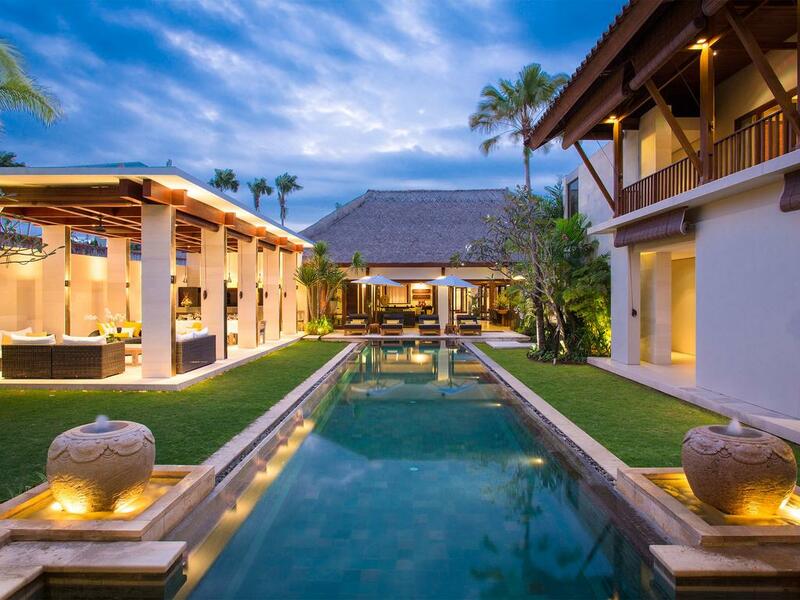 STAFF Manager, chef, butler/service staff (24-hour), gardener, security. Additional staff (babysitters, masseuses) available on request. DINING Western, Asian, vegetarian and children’s dishes from a priced menu. Requests accommodated (including special diets). 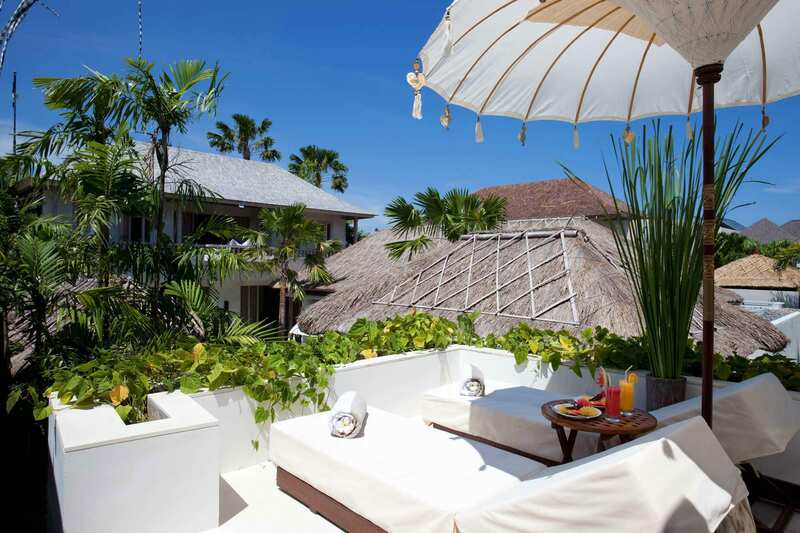 COMMUNICATION Wi-Fi internet, telephone landline (local and IDD calls extra). ENTERTAINMENT Satellite TVs, DVD players, DVD library, Sono sand Bose music systems, iPod docks, books and magazines. 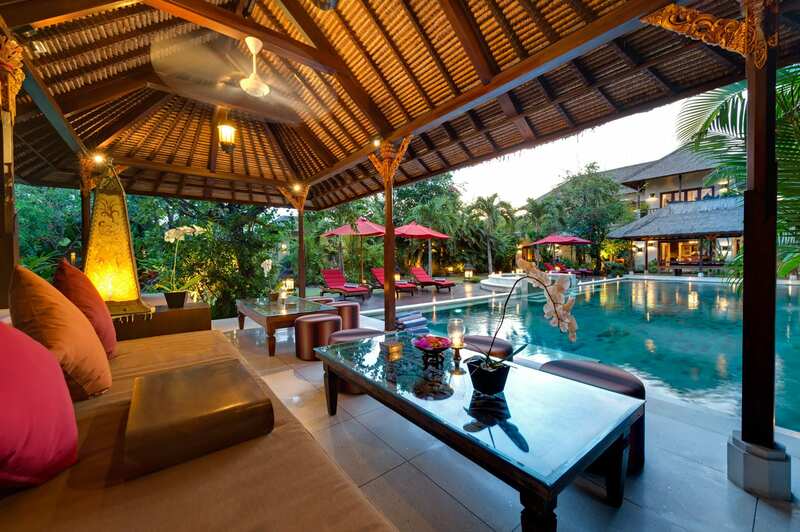 FOR FAMILIES Villa Adasa is well equipped for families. Facilities include a high chair, baby cot, pool safety fence (on request). 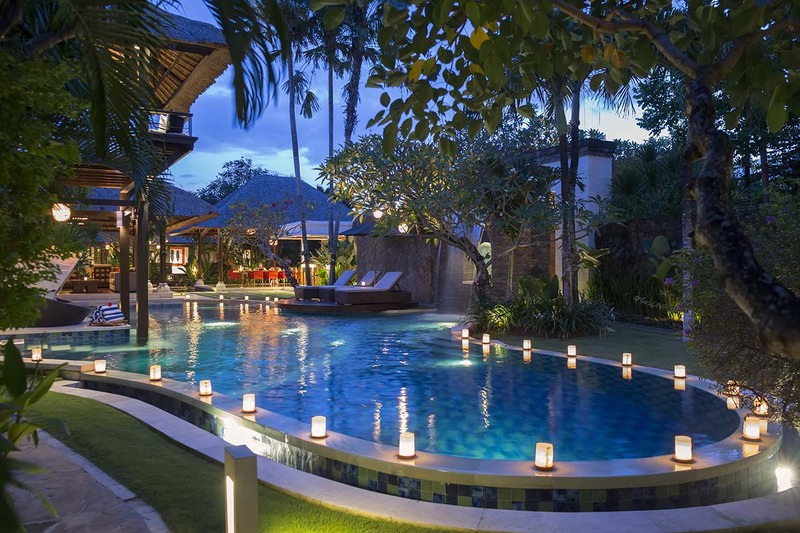 SPA On request, treatments selected from a comprehensive spa menu can be carried out by professional beauty therapists in the privacy of the villa (extra costs apply). 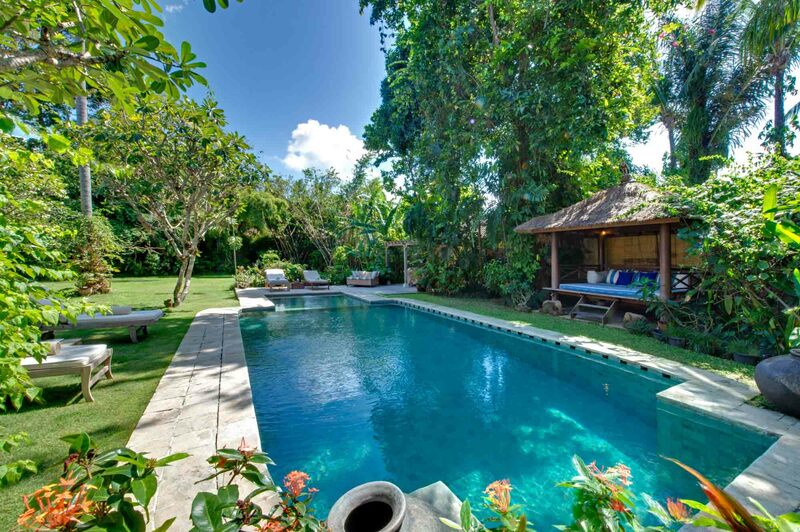 TRANSPORT Villa Adasa’s central location means that many attractions are within easy walking distance. 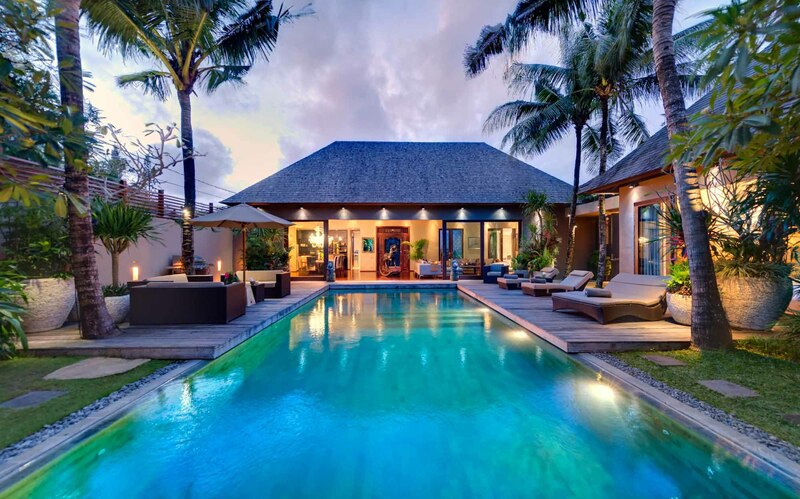 If additional transport is required, the villa manager will happily call one of the island’s safe and reasonably priced metered taxis, or organise the hire of a car and driver. ADDITIONAL Barbecue, in-room safes, massage bed, generator back-up. 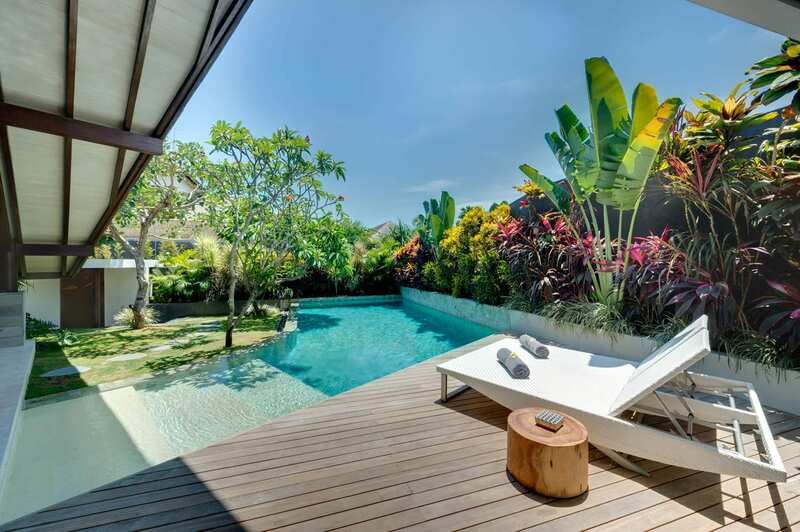 Villa Adasa is cocooned in Seminyak’s exclusive, Laksmana Villas Residential Estate, an ultra-luxury gated community with round-the-clock security in a cul-de-sac across from The Legian. 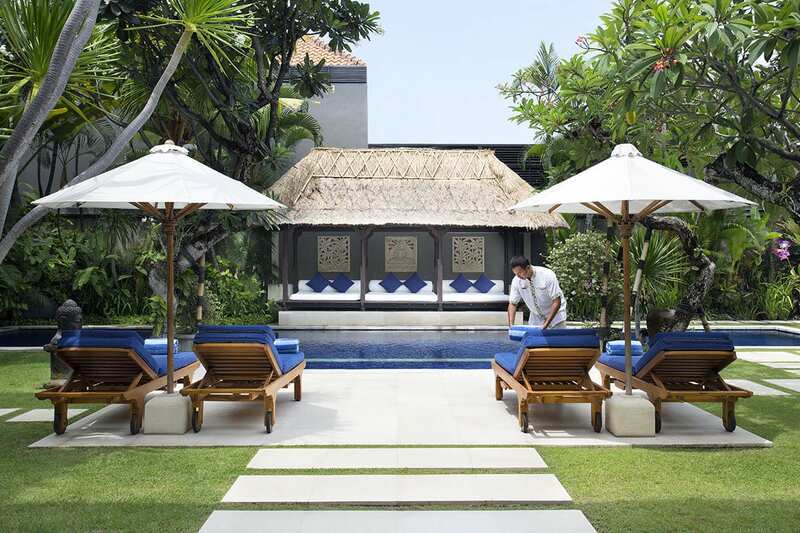 The beach is just five minutes stroll away, as is the iconic La Lucciola and the Breeze at Samaya. 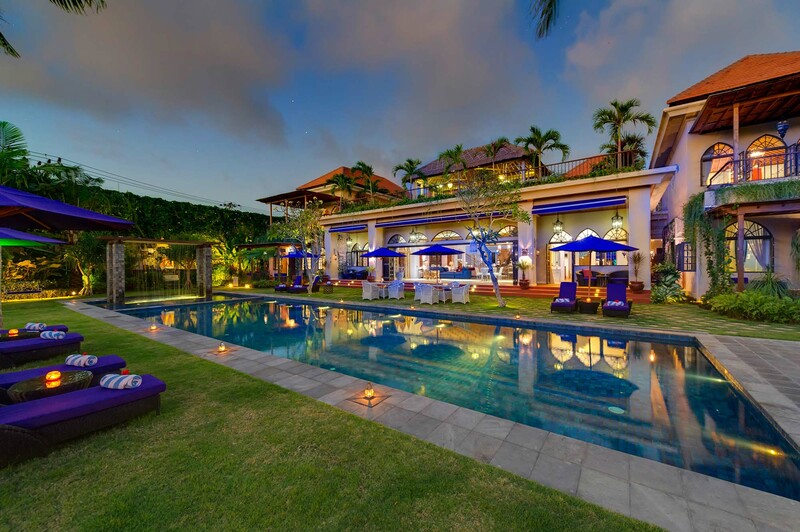 Other famed restaurants and bars, Ku Dé Ta and Sarong included, are within walking distance, and the up-market shops and eateries of Jalan Laksmana are just around the corner. 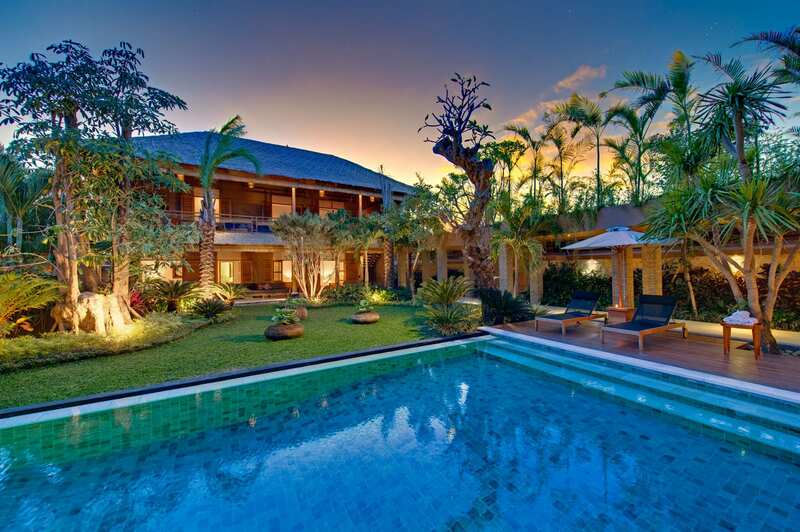 Thank you to all the staff at Villa Adasa. Cheerful, efficient and helpful!! 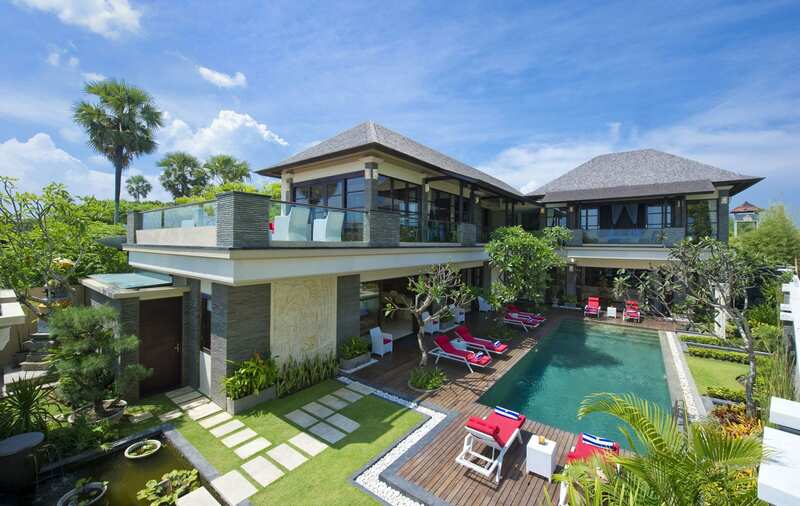 The villa itself was a great place for family of 6 to get together, relax and do nothing. We are going back home brownest, fatter, more well rested and happier! Thank you for the lovely stay and such wonderful and kind service. 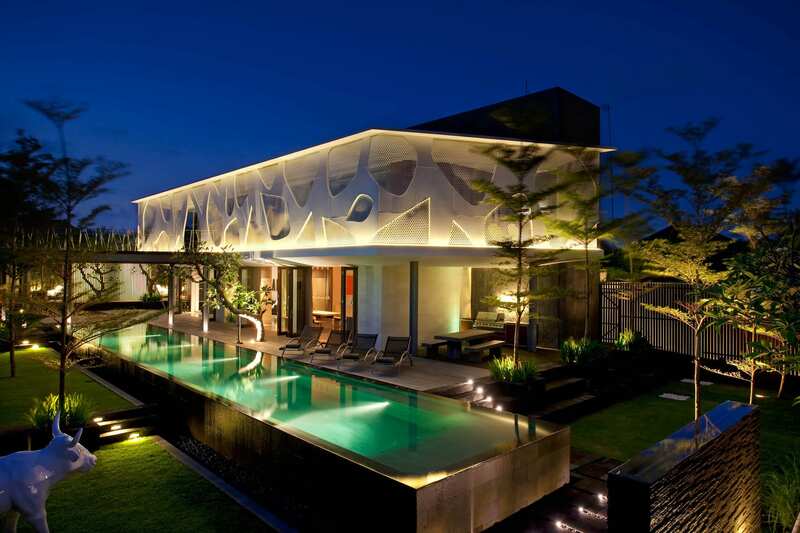 We would definitely stay at Villa Adasa again!! Villa Adasa- Exceeded all my expectations a wonderful place to escape for a family holiday,so central to everything we could walk everywhere. The staff we so accommodating in every way but never intruded on you it was like they were never there 10/10 for staff.